On Saturday, March 11, 2017 the Seneca Waterways Council, Boy Scouts of America kicked off its 29th annual Scouting for Food Drive. The food drive is the Scouts’ single largest community service project for the Seneca Waterways Council. More than 5,000 Scouts and adult volunteers go out in area neighborhoods leaving bags and flyers on residents’ front doors that explain how the community can help support the food drive and families in need. The Scouts return on Saturday, March 18th to pick up food donations. Scouts of Seneca Waterways Council will return to front doors and collect Scouting for Food donations on Saturday, March 18th, 2017. The Boy Scouts set a goal of collecting 70 tons of food this year to help restock the depleted supplies at more than 100 food pantries and hunger relief agencies across the Council’s five county service area - Monroe, Ontario, Seneca, Wayne, and Yates Counties. Items most in need include anything nonperishable such as pasta, rice, canned foods, peanut butter, soups, juices and cereal. Paper products and toiletries are accepted but avoid leaving anything in a glass container so there is no concern for safety from breakage. Residents are asked to leave donations in bags outside their front doors by 9:00 am on Saturday, March 18th for the Scouts to pick up. The drive is a collaborative partnership between the Boy Scouts of America, Seneca Waterways Council, Tops Friendly Markets and Mark’s Pizzeria which will serve as additional donation locations. 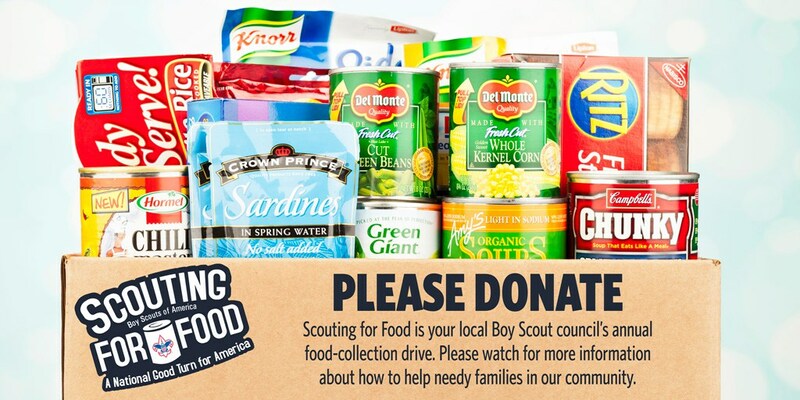 Scouts will be out at all area Tops Markets on Saturday, March 18th from 10-4pm taking food donations. Donations are also being accepted at all Mark’s Pizzeria locations through the end of the month. For the past 29 years, Scouts have been helping provide for the basic food needs of families! Scouting was founded on the premise of doing a good turn daily. Community service is very important in the character building process and Scouts have made the commitment to give back to their community through service projects that make a difference in the lives of others. One of the ways Scouts make a significant difference is through the annual Scouting for Food Drive held every spring in March which is a critical time for food pantries as their supplies are depleted from the winter and holiday season. It's also a time of increased need as spring break (from school) means families do not have access to school subsidized meals. “The impact of our Scouting For Food drive for families in need is significant,” said Stephen Hoitt, Scout Executive & Chief Executive Officer of the Seneca Waterways Council, Boy Scouts of America. “Collecting 70 tons of food could help keep the shelves stocked at food pantries for a couple months in order to manage the food needs of families.” Hoitt added that as families deal with the aftermath of this week’s windstorm many will turn to their food pantries for assistance and the food demand will increase. Tops Friendly Markets, Mark’s Pizzeria, Manning & Napier, UBS, and Open Door Mission support the Scouts’ effort as partners and sponsors of this year’s food drive. Boy Scouts of America. Seneca Waterways Council, Inc. serves 10,600 youth in Monroe, Ontario, Wayne, Seneca, and Yates Counties. Seneca Waterways Council provides an educational program for boys and young adult men and women to build character, to train in the responsibilities of participating citizenship, and to develop personal fitness. Learn more at www.senecawaterways.org. 0 Comments to "Scouting for Food Kicks Off To Help Families In Need"